This handcrafted removable cable is made for stereo or balanced connections where there's a single connection on the headphone that's typically positioned on either the left or right side. 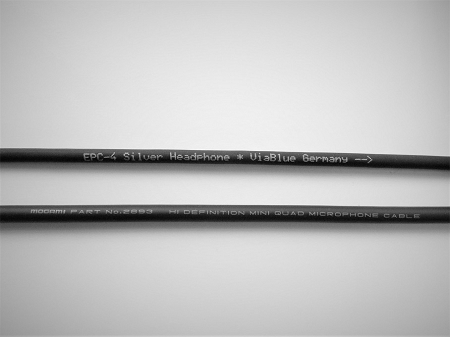 Cable choice between professional grade Mogami 2893 Copper or ViaBlue EPC-4 Silver headphone cable. Cardas silver solder used on Mogami cable and ViaBlue silver solder used on ViaBlue cable. Standard length is 5ft or 60 inches. Additional length per foot available. Pair of 3.5mm TRS straight Neutrik/Rean connectors. Other options available. Double layer heat shrink where applicable for durability.